Contains all the favorites, with highlights in both sacred and secular music. Titles: Angels from the Realms of Glory * Lovely Sky of Christmas Eve * What Can I Give Him * Sleep, O Sleep, My Lovely Child * Patapan * The White World of Winter * The Christmas Tree with Candles Glowing * Winter Wonderland * and more. 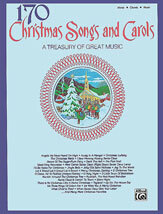 Various Composers – Contains all the favorites, with highlights in both sacred and secular music. Titles: Angels from the Realms of Glory * Lovely Sky of Christmas Eve * What Can I Give Him * Sleep, O Sleep, My Lovely Child * Patapan * The White World of Winter * The Christmas Tree with Candles Glowing * Winter Wonderland * and more.